Have you ever hesitated to buy a gadget because it wasn’t quite right? Or perhaps you bought something but found the technology wasn’t up to the job? You’re not alone, but there are always new things coming onto the market or retooled devices that might fit the bill. So we’re having a first look at the all-new Kindle Paperwhite e-reader, the Fitbit Charge 3 and the iRobot Roomba i7+. These three rebooted and upgraded gadgets have enhancements that put them on our top picks list and might prove to be good choices this holiday season. Even if you prefer to read books in print, it’s handy to have an Amazon Kindle Paperwhite. It’s compact, affordable and low-cost, and free e-books are plentiful these days. You can read at night without additional light: e-ink is easy on the eyes and the effect of the glare-free screen is less likely to keep you awake after you turn out the lights. A Kindle takes up very little space, making it handy for trips. Previous models were basically toast if they got wet – you can read our review of the original Amazon Kindle Paperwhite, but the fourth generation has a waterproof body. It’s IPX8 rated, so if you soak it in up to two metres of fresh water for an hour, simply dry it off and you’re good to go. The basic model comes with eight GB of memory, twice that of previous models, so it can stores thousands of books. There’s even a 32-GB model. More storage is great since this Kindle also supports Audible, allowing you to listen to audiobooks, perhaps through a Bluetooth speaker or headset. 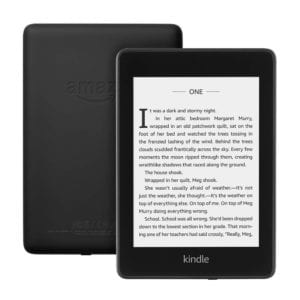 This Kindle is slightly smaller and lighter than previous versions. It still has a six-inch high-resolution 300 pixels-per-inch display, a battery life measured in weeks, and great reading features such as Whispersync, Goodreads and X-Ray. Prices start at C$139.99 and they’re available from your favourite retailers, including Amazon. Another gadget that’s received a waterproof makeover is the new Fitbit Charge 3. It still has all the features from the recently reviewed Fitbit Charge 2, but now it’s protected from the elements. You can take it into the shower or into the pool, where it will track your laps. The side button has been replaced with a touch sensor. The larger display area is made from durable Corning Gorilla Glass 3 with a full touchscreen as well. Notifications are also enhanced. Rather than being limited to calendar, texts and all alerts, there’s additional support for apps like weather. For health tracking, in addition to the heart rate sensor, the Charge 3 has a sensor that measures oxygen in the blood. It also has a slate of goal-based workouts and you can set goals right from the your wrist. It has a new proprietary charger and battery life is now rated at seven days instead of four or five. 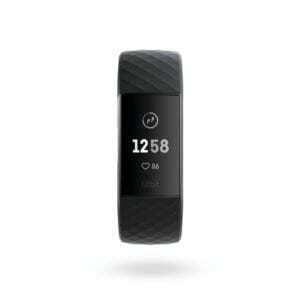 The Fitbit Charge 3 starts at C$199.95, the same price as the previous model. You can find it at many retailers, including Amazon. 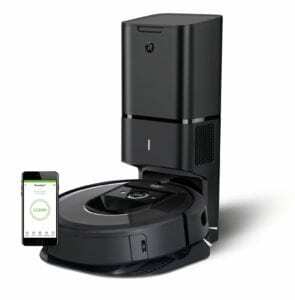 Nobody loves to vacuum, but an automated intelligent companion like the new Wi-Fi-connected iRobot Roomba i7+ vacuum makes for fun and efficient cleaning. iRobot’s latest iteration is reimagined with an updated app and its third-generation intelligence actually learns the lay of the land – or your home – as it cleans. It uses mapping technology to figure out the best way to clean each room. It also learns to identify rooms, which you can label and then with Google and Alexa integration, you can simply say, “Roomba, clean the living room.” It can even remember multiple floor plans in case you have a multi-floor house or a summer cottage. Don’t let its size fool you. Its 3-Stage Cleaning System ensures a decent clean. It also has dual multi-surface rubber brushes and power-lifting suction to properly clean different floor surfaces. And with the optional automatic dirt disposal feature, it can empty itself unattended – up to 30 times. Roomba i7+ with dirt disposal retails for C$1,249.99. Roomba i7 alone is C$899.99. The Clean Base Automatic Dirt Disposal is also sold separately for C$429. It’s available at all major retailers and Amazon. We’re putting all three of these gadget reboots through tests and will offer full reviews later. First Published & syndicated via Troy Media. Greg Gazin, also known as the Gadget Guy and Gadget Greg, is a syndicated veteran tech columnist, communication, leadership and technology speaker, facilitator, blogger, podcaster and author. Reach him @gadgetgreg or at GadgetGuy.ca.